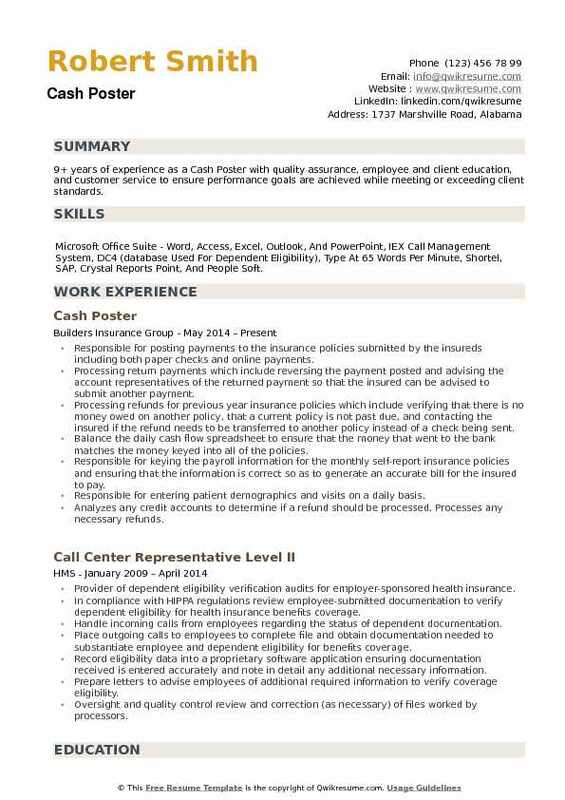 The job description for this title varies based on the work or industry setting, but the most common duties that can be found on the Cash Poster Resume revolve around the following – taking responsibility of posting all cash receipts that are performed manually or electronically, assisting with daily remits, monitoring and overseeing submission of claims that are given for secondary payments, taking responsibility of expedient and accurate posting of received payments and handling all other tasks as assigned. Irrespective of job setting, the Cash Posters are expected to demonstrate these skills and abilities in their resumes –the ability to handle a high volume of cash transactions, proficiency in MS Office, PeopleSoft and other relevant software; good knowledge of accounting, and the ability to keep all transactions up-to-date. A Degree in Accounting, Finance or Commerce is commonplace among most of the Cash Posters. Summary : 9 years of experience as a Cash Poster is looking for a position that will utilize my skills to enhance the production of a prominent business. Quick and fast learner and a great team player as well. Skills : Billing, Data Entry, Receptionist, Scheduling, Software Knowledge: Nextgen, HPF, DCS, Paragon, AS400, Microsoft Office, Typing 10 Key Clerical Billing ( Posting, Rejects, Claims) Filling, Ordering, Supplies, Bilingual, And Cash Handling. Complete month-end reports of daily cash receipts and daily cash journal. Research and maintain an excel spreadsheet of all electronic ach, eft, ra, and physical checks received at the office by matching amounts paid to amounts due on current and delinquent accounts. Accurately timely posts all cash, checks, credit cards and electronically transferred funds to accounts. Answer telephones and give information to callers, take messages or transfer. Collect and deposit money into accounts, disburse funds from cash accounts to pay bills or invoices, keep records of collections and disbursements. 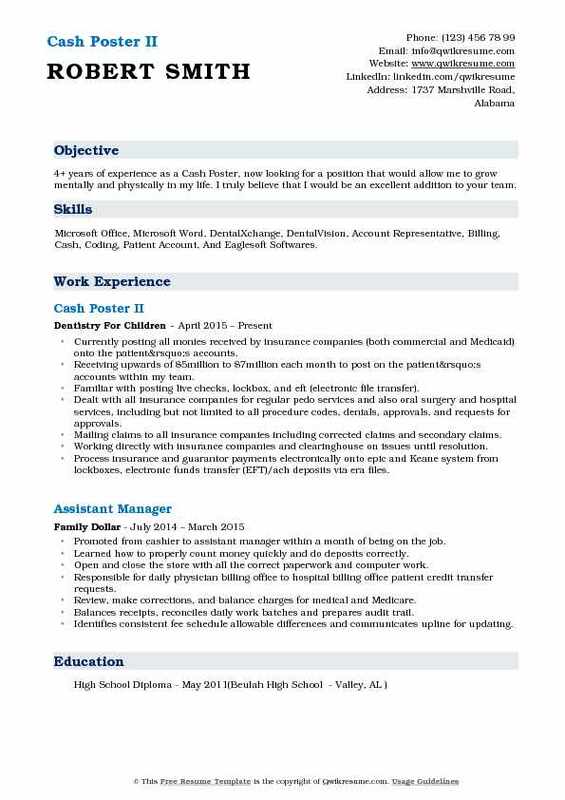 Objective : One year of experience as a Cash Poster is seeking to be part of a company or organization where I can grow and excel in and to finish and get my degree in General Studies. Skills : Accounting, Accounting Systems, Cash Management, Excellent Written Communication, Problem Solving, Analytical, MS Office, And Lotus. Manage Lockboxes, wire transfers, and deposit slips from the billing specialists. Examine, analyze, and interpret all financial data prior to inputting and applying the payment to ensure information is correct. Responsible for applying anywhere from $500,000 to $2,000,000 in transactions to 10 separate bank accounts. Work effectively with all involving personnel and maintaining positive relationships and open lines of communication with all accounts and accounts receivable clerks. Coordinating with credit analysts to solve discrepancies and inconsistencies when they occur. Solving discrepancies includes tracing transactions. Identifying the source of error, and taking appropriate steps to resolve the issue. Verification of batch reports necessary to ensure accuracy prior to posting. Excel spreadsheet maintained for easy referencing. Light bank reconciliation required assisting accountants to balance bank statement with spreadsheets consisting of a data dump from. 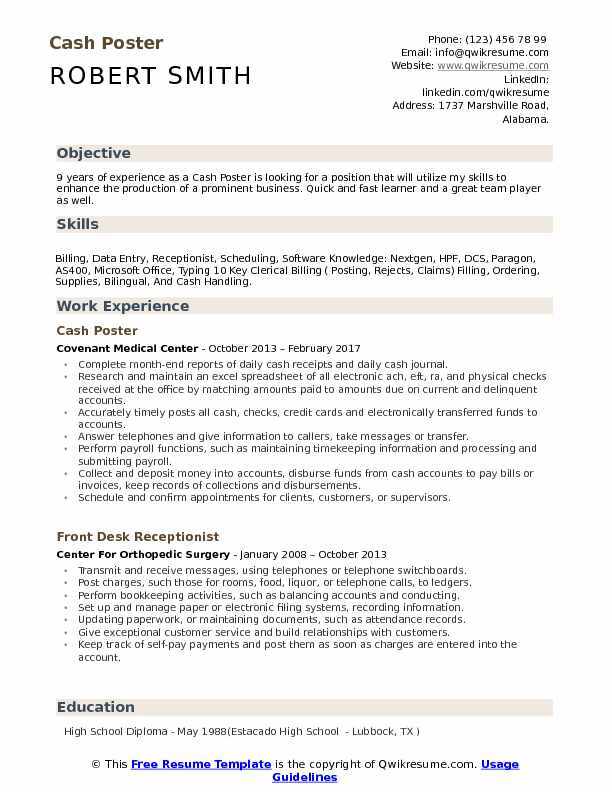 Objective : 3+ years of experience as a Cash Poster. Ability to identify problems and implement effective solutions. Loyal, conscientious, and dependable. Possess a quote, company attitude dedicated to the growth and profitability of the company. 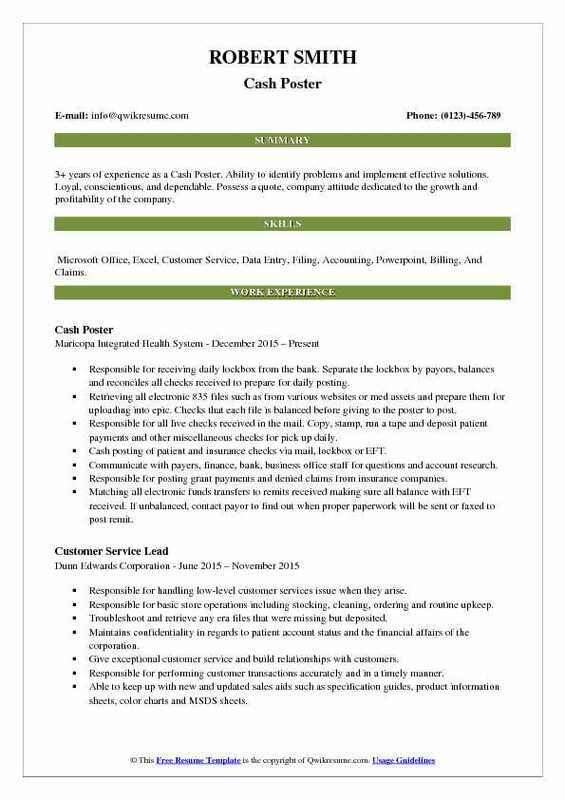 Skills : Microsoft Office, Excel, Customer Service, Data Entry, Filing, Accounting, Powerpoint, Billing, And Claims. Responsible for receiving daily lockbox from the bank. Separate the lockbox by payors, balances and reconciles all checks received to prepare for daily posting. Retrieving all electronic 835 files such as from various websites or med assets and prepare them for uploading into epic. Checks that each file is balanced before giving to the poster to post. Responsible for all live checks received in the mail. Copy, stamp, run a tape and deposit patient payments and other miscellaneous checks for pick up daily. Cash posting of patient and insurance checks via mail, lockbox or EFT. Communicate with payers, finance, bank, business office staff for questions and account research. Responsible for posting grant payments and denied claims from insurance companies. Matching all electronic funds transfers to remits received making sure all balance with EFT received. If unbalanced, contact payor to find out when proper paperwork will be sent or faxed to post remit. Objective : Accomplished Cash Poster offering a background of more than 3 years processing return checks and credit card payments. Proficient in IDX and knowledgeable in general accounting procedures. Skills : Software Knowledge: Nextgen, HPF, DCS, Paragon, AS400, Microsoft Office, Data Entry, And Cash Handling. Accurately posting all patient and insurance payments to patient accounts as received daily, taking the appropriate contractual adjustments. Downloading electronic remittances from payers and accurately post to patient accounts. Recognizing and informing the Manager of underpayments by carriers based on the contractual agreement with each carrier. Balancing and closing each payment batch. Enter required batch information in the month end. Required to have all transactions posted for the closing month by the 5th business day of the following month. Posting payments, as received, within 3 days of receipt. Reports to the billing manager. Always performed concise and thorough documentation in patients charts. Apply insurance payment according to specific data and procedures according to eob. Review and processing of refunds to patients and insurances as required and requested. Summary : 9+ years of experience as a Cash Poster is now seeking a position that will allow me to learn and grow where I can share my skill set and expand on it. Core competencies include determination, active listening, and quick thinking as well as excellent communication and time management skills. Skills : Medical Billing & Coding ICD-9-CM, CPT/HCPCS Coding, Familiarity With ICD-10-CM And ICD-10-PCS, Medical/Dental Terminology, HIPAA, Medical Records CMS-1500 Claims Preparation, Submission, Appeals (Medicare, Medicaid, Commercial). Diligently works on various cash department projects: refunds, offsets, researching suspense and overpayment accounts, sorting and processing correspondences. Comfortable pulling explanation of benefits (EOBS) from websites/internet. Delegated as a point person for Newyork clinics and relevant inquiries. Heavy interactions with the collections department via phone, email and in person. Well versed in the comprehension and accurate processing of the explanation of benefits (EOBS). Consistently works to balance and research accounts in order to meet strict monthly deadlines. Help prepare patient and insurance refunds by doing research and gathering proof of overpayments. Keep track of self-pay payments and post them as soon as charges are entered into the account. 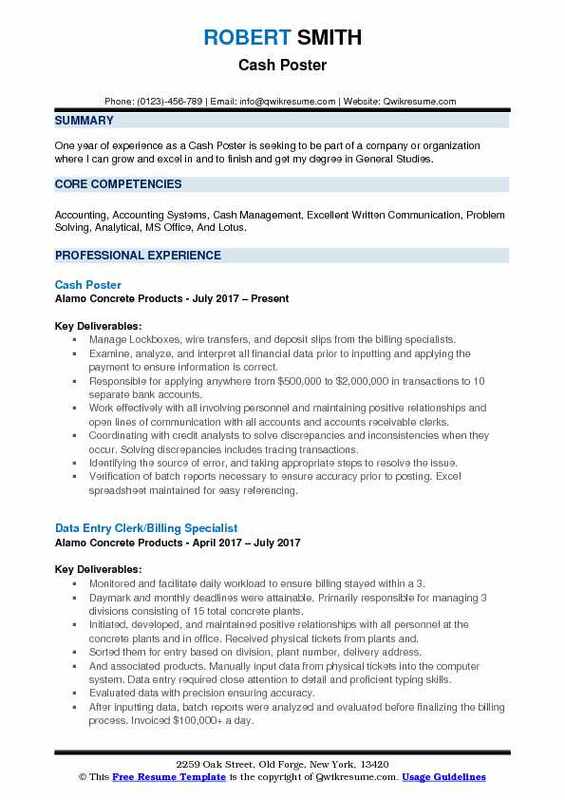 Objective : 4+ years of experience as a Cash Poster, now looking for a position that would allow me to grow mentally and physically in my life. I truly believe that I would be an excellent addition to your team. 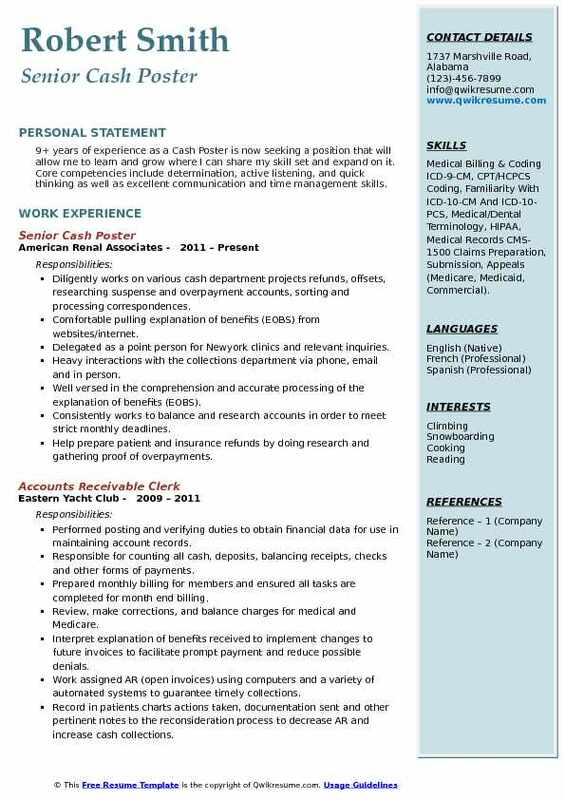 Skills : Microsoft Office, Microsoft Word, DentalXchange, DentalVision, Account Representative, Billing, Cash, Coding, Patient Account, And Eaglesoft Softwares. Currently posting all monies received by insurance companies (both commercial and Medicaid) onto the patient’s accounts. Receiving upwards of $5million to $7million each month to post on the patient’s accounts within my team. Familiar with posting live checks, lockbox, and eft (electronic file transfer). Dealt with all insurance companies for regular pedo services and also oral surgery and hospital services, including but not limited to: all procedure codes, denials, approvals, and requests for approvals. Mailing claims to all insurance companies including corrected claims and secondary claims. Working directly with insurance companies and clearinghouse on issues until resolution. Process insurance and guarantor payments electronically onto epic and Keane system from lockboxes, electronic funds transfer (EFT)/ach deposits via era files. Summary : I am a self-starter and a team player with a personable persona. 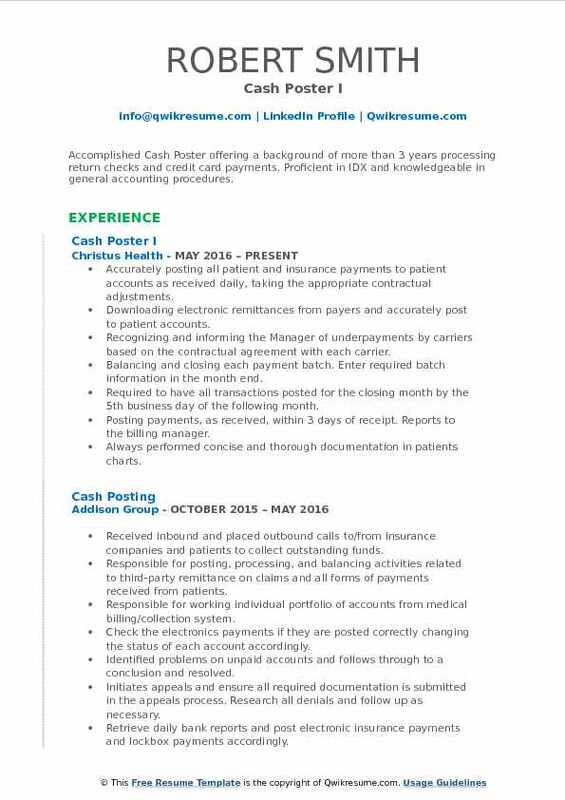 Over 11 years of accounts receivable experience as a Cash Poster in the medical field. I have excellent communication skills utilized in resolving customer queries. Attention to detail within tight deadlines. Skills : Accounting, Microsoft Office, Multi-phone, Quickbooks, Customer Service, Excel, Word, Phlebotomy, ICD-9, EClinical, CPT, HCPCS, Springcharts, Typing, Medical Terminology, Medisoft, Soriano, And ECube. Responsible for the prompt and accurate timely posting of all electronic 835 files. Responsible for accurate and timely posting of all lockbox payments, patient credit card, and check. Balances batch totals posted to deposit amount and forward appropriate documents to SRCO reconciliation. Utilizing the patient accounting host system and all other systems/applications proficiently in order to resolve patient account balances and process payment transactions appropriately. Adheres to established advocate and SRCO policies, procedures, guidelines and productivity standards. Answer client account inquiries for billing and collections related questions. Obtain additional documentation to attach to invoices to facilitate payment and reduce rejections. Record invoices to be credited on the specified spreadsheet for manager approval. 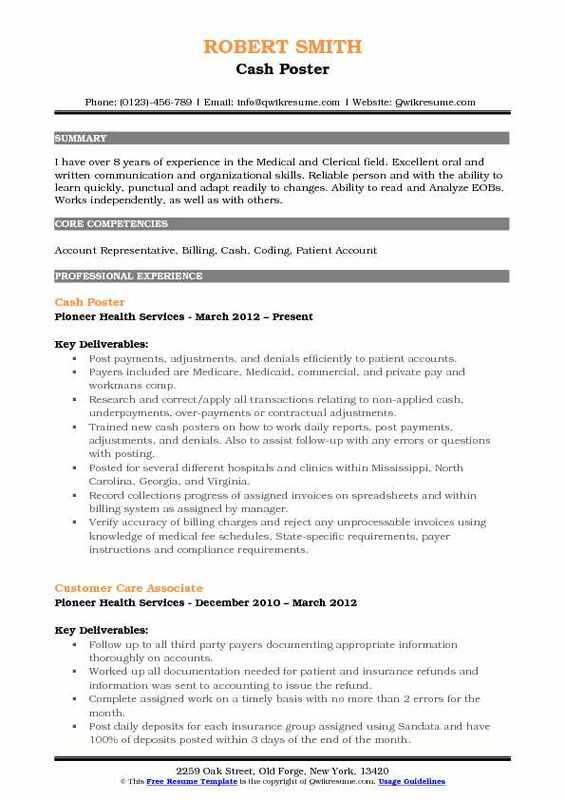 Summary : I have over 8 years of experience in the Medical and Clerical field. Excellent oral and written communication and organizational skills. Reliable person and with the ability to learn quickly, punctual and adapt readily to changes. Ability to read and Analyze EOBs. Works independently, as well as with others. Post payments, adjustments, and denials efficiently to patient accounts. Payers included are Medicare, Medicaid, commercial, and private pay and workman's comp. Research and correct/apply all transactions relating to non-applied cash, underpayments, over-payments or contractual adjustments. Trained new cash posters on how to work daily reports, post payments, adjustments, and denials. Also to assist follow-up with any errors or questions with posting. Posted for several different hospitals and clinics within Mississippi, North Carolina, Georgia, and Virginia. Record collections progress of assigned invoices on spreadsheets and within billing system as assigned by manager. Verify accuracy of billing charges and reject any unprocessable invoices using knowledge of medical fee schedules, State-specific requirements, payer instructions and compliance requirements. 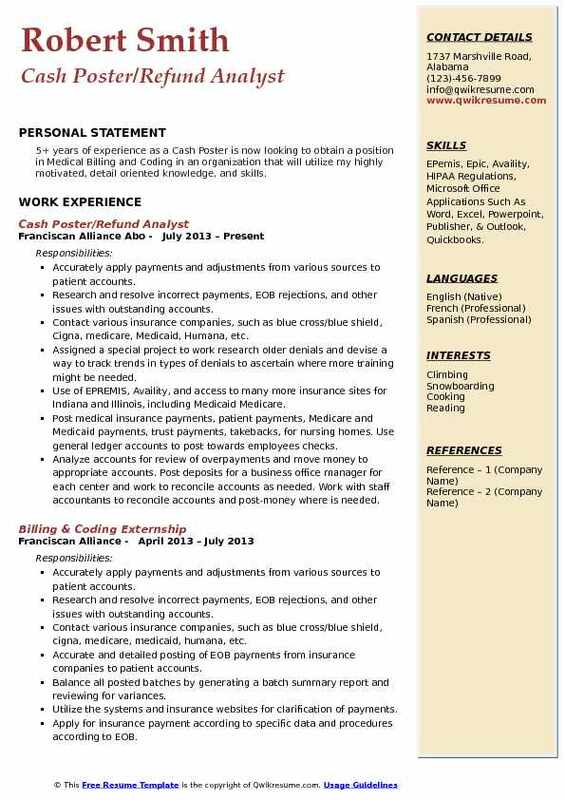 Headline : 5+ years of experience as a Cash Poster is now looking to obtain a position in Medical Billing and Coding in an organization that will utilize my highly motivated, detail oriented knowledge, and skills. Skills : EPemis, Epic, Availity, HIPAA Regulations, Microsoft Office Applications Such As Word, Excel, Powerpoint, Publisher, & Outlook, Quickbooks. Accurately apply payments and adjustments from various sources to patient accounts. Research and resolve incorrect payments, EOB rejections, and other issues with outstanding accounts. Contact various insurance companies, such as blue cross/blue shield, Cigna, medicare, Medicaid, Humana, etc. Assigned a special project to work research older denials and devise a way to track trends in types of denials to ascertain where more training might be needed. Use of EPREMIS, Availity, and access to many more insurance sites for Indiana and Illinois, including Medicaid Medicare. Post medical insurance payments, patient payments, Medicare and Medicaid payments, trust payments, takebacks, for nursing homes. Use general ledger accounts to post towards employees checks. Analyze accounts for review of overpayments and move money to appropriate accounts. Post deposits for a business office manager for each center and work to reconcile accounts as needed. Work with staff accountants to reconcile accounts and post-money where is needed. Identifies consistent fee schedule allowable differences and communicates upline for updating. 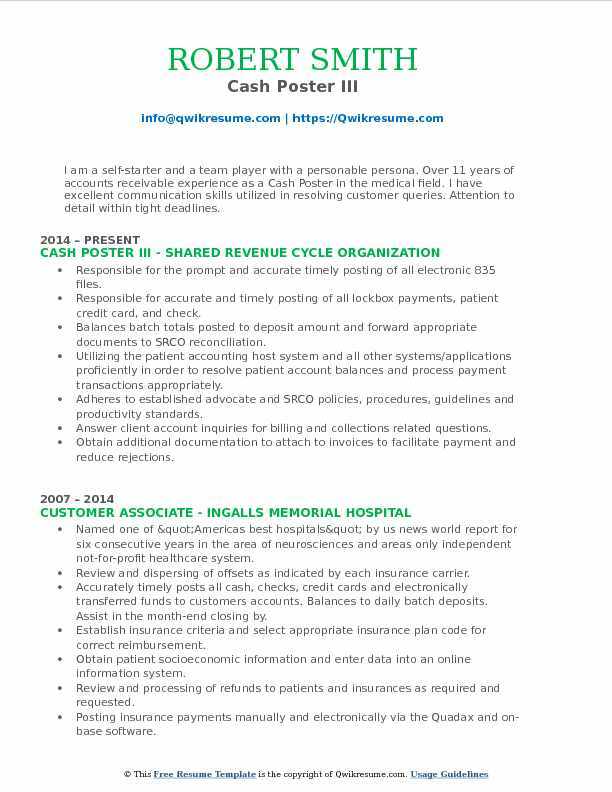 Summary : 9+ years of experience as a Cash Poster with quality assurance, employee and client education, and customer service to ensure performance goals are achieved while meeting or exceeding client standards. Skills : Microsoft Office Suite - Word, Access, Excel, Outlook, And PowerPoint, IEX Call Management System, DC4 (database Used For Dependent Eligibility), Type At 65 Words Per Minute, Shortel, SAP, Crystal Reports Point, And People Soft. Responsible for posting payments to the insurance policies submitted by the insureds including both paper checks and online payments. Processing return payments which include reversing the payment posted and advising the account representatives of the returned payment so that the insured can be advised to submit another payment. Processing refunds for previous year insurance policies which include verifying that there is no money owed on another policy, that a current policy is not past due, and contacting the insured if the refund needs to be transferred to another policy instead of a check being sent. Balance the daily cash flow spreadsheet to ensure that the money that went to the bank matches the money keyed into all of the policies. Responsible for keying the payroll information for the monthly self-report insurance policies and ensuring that the information is correct so as to generate an accurate bill for the insured to pay. Responsible for entering patient demographics and visits on a daily basis. Analyzes any credit accounts to determine if a refund should be processed. Processes any necessary refunds.